In a bit of bittersweet news, Jason Momoa was on deck to play Dwayne Johnson's brother in the upcoming Fast and Furious spin-off Hobbs and Shaw. Unfortunately, it wasn't in the cards. At least not for now. However, The Rock has left the door open for the possibility that Momoa could appear in the sequel, assuming one gets made. And given the history of this franchise, that seems highly likely. Dwayne Johnson has been hyping up the first-ever spin-off within the franchise, with the first trailer set to debut on Friday, in addition to a spot airing during the Super Bowl this weekend. 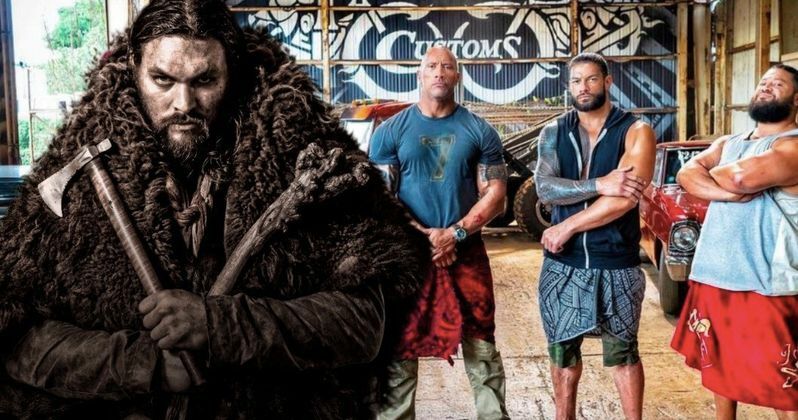 In a recent Instagram post, the wrestler-turned-actor revealed his full lineup of brothers who are set to appear in Hobbs & Shaw. Buried in the comments section, Johnson replied to a fan who was inquiring about Jason Momoa's whereabouts, as the Aquaman star looks like he would have fit in perfectly. Johnson had this to say. "Yup me and Jason Momoa tried hard to get him in this movie to play my brother, but his schedule was too packed. Next Hobbs movie for sure." While it's easy to focus on the fact that Jason Momoa was wanted for the movie, it's worth focusing on the second part of that statement. No doubt, Universal is already planning, or at least hoping, for a sequel, assuming Hobbs & Shaw does anywhere near what a standard movie in this franchise does at the box office. If that happens, this Momoa/Rock team-up may still become a reality. Since Jason Momoa wasn't available, given his busy shooting and press schedule for Aquaman, Joe Anoa'i, aka WWE star Roman Reigns, landed the gig. But in the same Instagram post, Dwayne Johnson revealed that he's going to have four brothers in the movie and provided a little bit of background information on them. Much like many of the core characters within the franchise, they went legit after starting out in a life filled with crime. "The Hobbs Brothers. In Samoa we have a word that means everything to us, aiga, which means family. My name is Luke Hobbs and these are my four brothers. My family. My aiga. They all live in Western Samoa where they own and operate 'Hobbs Customs,' a former illegal chop shop, now a legit business where they build and deliver vintage custom cars all over the world. In Samoa we have another saying which is 'Ou te le tau to'atasi ae matou te tau fa'atasi' which means, When you fight one, you fight us all. Biggest showdown the Fast & Furious Universe has ever seen is coming this summer."